Hey, who's this with a new addition? It's our very own webmistress Kat Parsons and her baby from the 2006 breeder rescue, Winterberry. On a combination adoption & friends visit at Thanksgiving to her home in Utah, Winterberry went to her new home where she enjoyed the mountain view and fresh air (at least for a little while till mom and dad packed up and moved to Elk Snout Illinois) Geez. 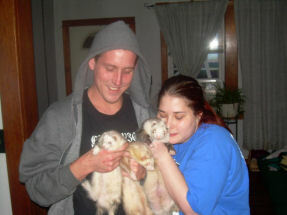 Marie and her boyfriend Scott adopted several ferrets from us after "ferret math struck". Here in Marie's arms is their first adoption, Lunchbox. One of the babies born from the 2006 breeder situation. Looks like love to me! from L to R, Peaches, Rudy, and Brando. Recent reports indicate that Brando has lost most of his pot belly (no doubt due to the lack of play he received prior to being surrendered). However, he did reveal to me that he wanted to surprise his mom and dad by fitting into his speedo for the summer. Chococat and Lunchbox pose together with Marie and Scott. obviously enjoying each other's company very much. 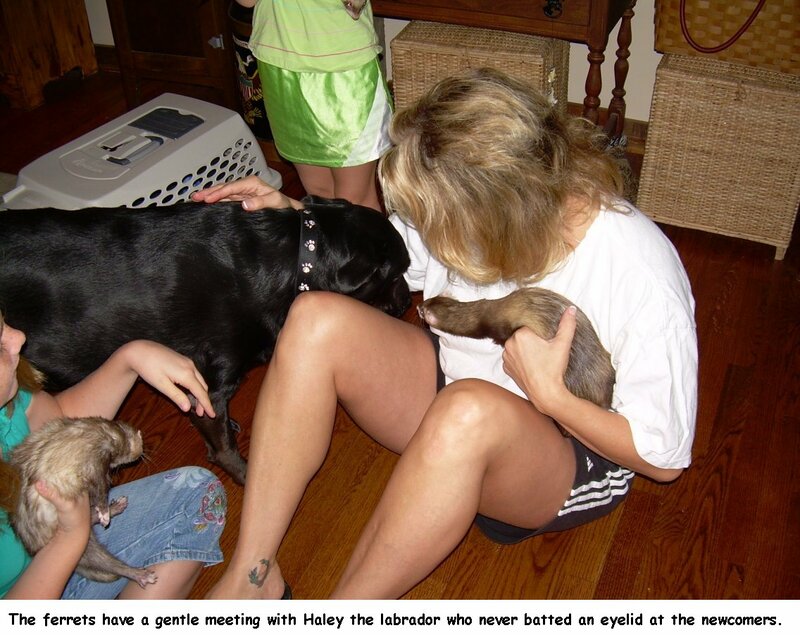 her stubby tailed lovebug, a baby born from the 2006 breeder rescue. 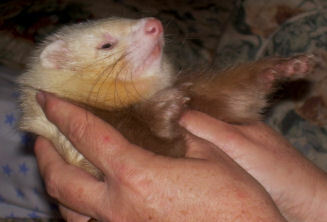 Kodiak also becomes putty in momma's hands when it's time for a nap. Mike Garvin pictured here with Hogan. "I always loved Hogan's Heroes and there was something about this guy that touched me right away" Hogan, rescued from a filthy basement breeder rescue now lives in the lap of luxury, love and human companionship. 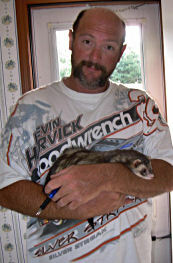 Mike Garvin gives a gentle and responsible introduction to the other animal companions of the house. The dogs are gentle and accepting. 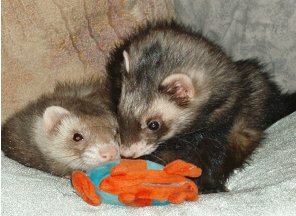 Mike and his wife Christine have become so enamorate with the love of their ferrets that they also adopted Simon, Cheerio, Cosmo and Smokey. How did it start? 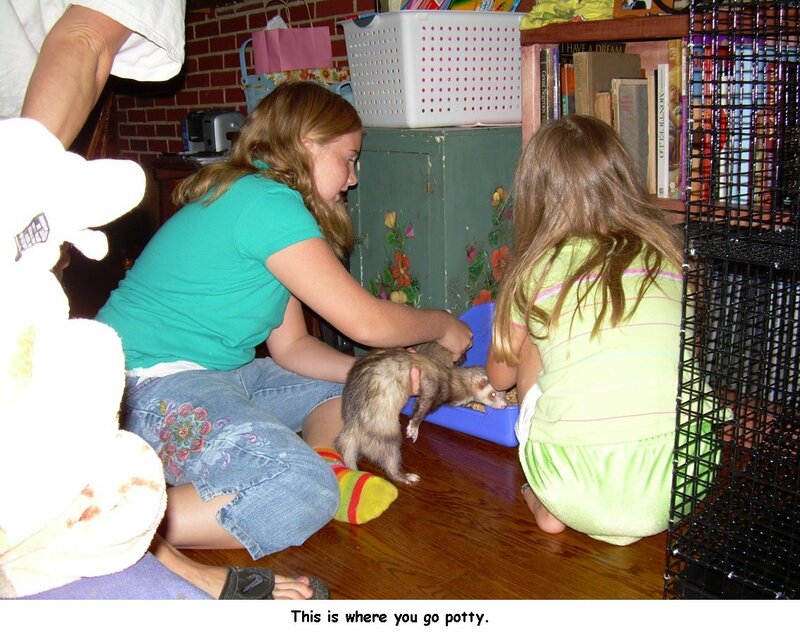 Mike found their first ferret at a job site and they had the heart to open their hearts and homes to give it a try. More pics to come but recent reports are that Cheerio has made leaps and bounds bonding with them (Cheerio also came from a background of neglect and abuse, enslaved in filthy breeding conditions with intial biting problems). We are as delighted with our adopters as the adopters are with their new additions. 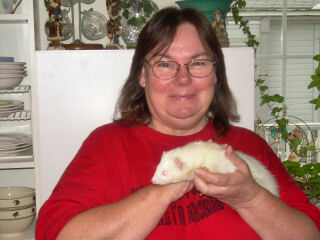 Nicki Frye, a former rescue mom herself, is pictured here with Possum. 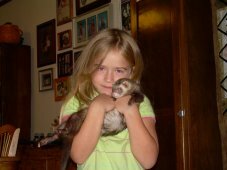 After her last ferret passed away, she decided against opening up her heart to ferrets ever again, until she met Otter and Possum. The outpouring of her heart and home did not stop there. She also adopted Deuce Bigalow. "Something about him reached out to me." 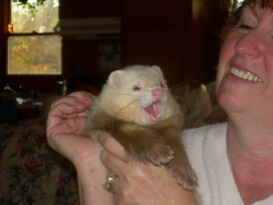 That's no surprise considering what a wonderful ferret mom she is. on a follow up adoption visit who's loving & playful nature are obvious here..even though we hadn't gotten to know him that well before we named him! Otter poses and exudes his happiness with his new digs. 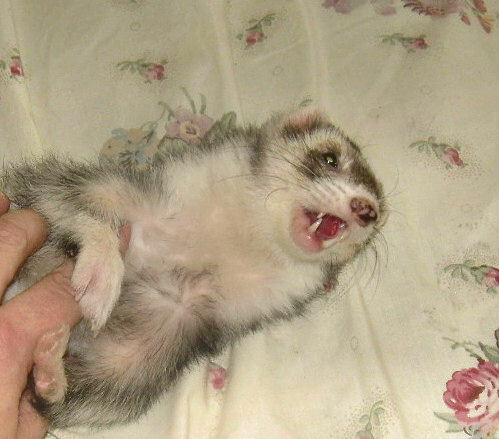 All of these ferrets are loved and spoiled beyond belief. Thank you Nicki!!!! I got left behind when my people got thrown out of their apartment. I'm a cute and playful silver mitt female under 2 years old. Adopted to Marie Mackamul and Scott Littlejohn. WinterBerry found a wonderful home with Kat and Tommy Parsons in Utah. 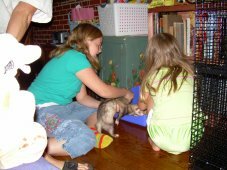 Adopting to the Eslingers, Dawn and her two girls Addison and Kendall, was one of those perfect adoptions. An educated decision,...a responsible family with two very exceptional young ladies. On the first visit to the rescue, Dutch worked his magic and his way into their hearts....I could tell that they were disappointed that they couldn't take the furkids home that day...but completely understood after I explained the adoption process. I had a good feeling the minute I met them. 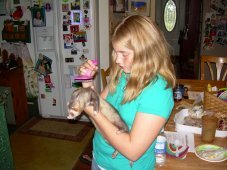 Everything moved along per schedule, cage & supplies ordered, home visit scheduled along with adoption day. When reviewing the adoption contract I noticed several sets of initials and wondered what was up with that....then I put it together and realized the daughters had signed the adoption contract also,....initials on each line of the agreements to be met. You simply couldn't ask for more responsible kids. 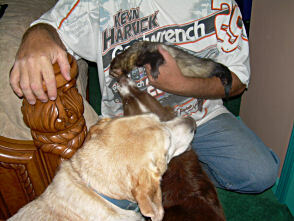 The ferrets have a gentle meeting with Haley the labrador who never batted an eyelid at the newcomers. 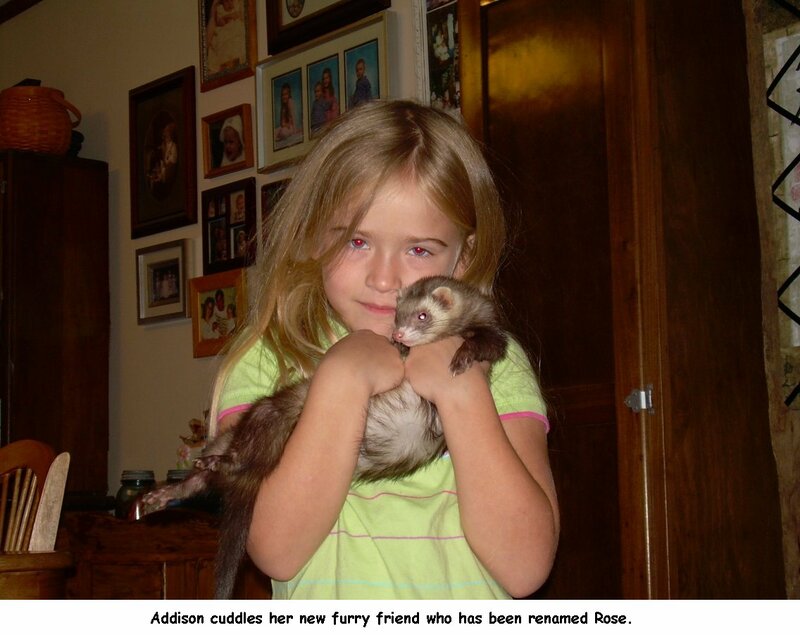 Addison cuddles her new furry friend who has been renamed Rose. This is where you go potty. This is for playing....not pottying! 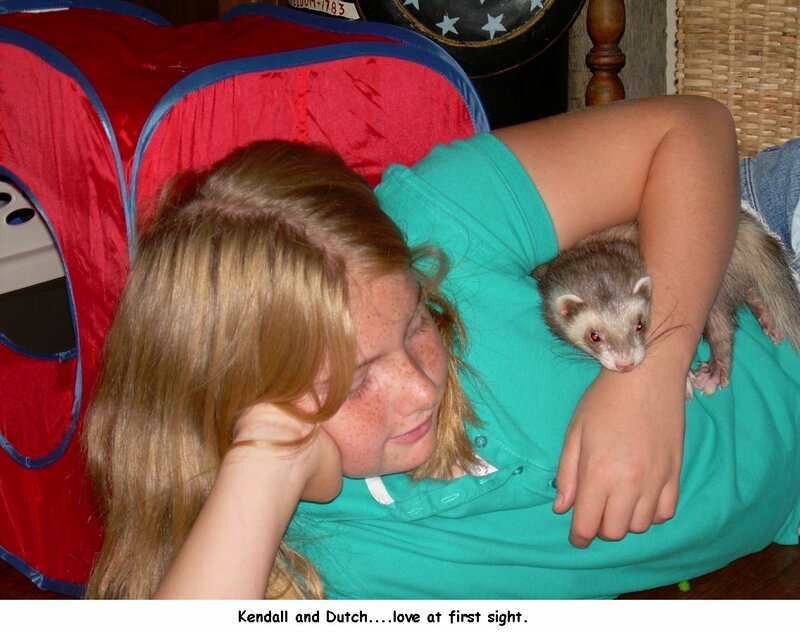 Kendall and Dutch....love at first sight. 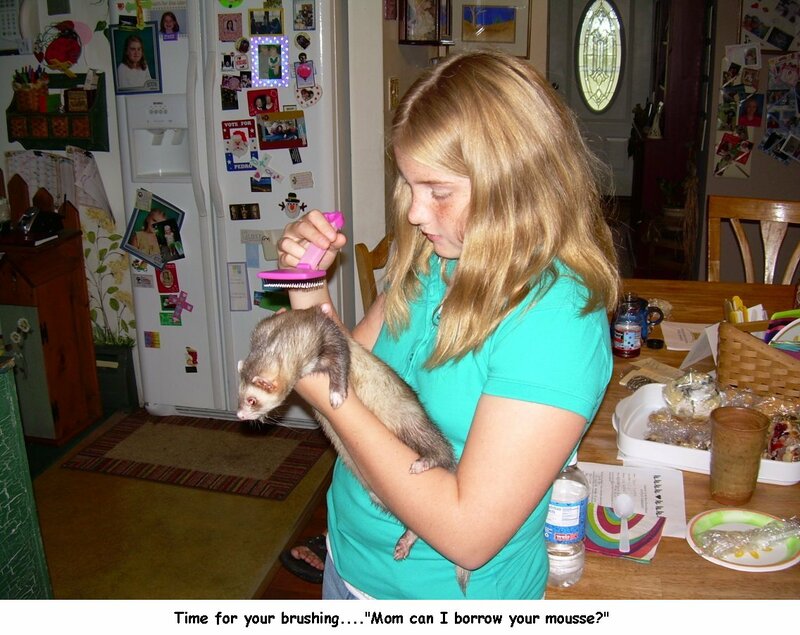 Time for your brushing...."Mom can I borrow your mousse?" TV Time....this bed is better than any sleep sack! 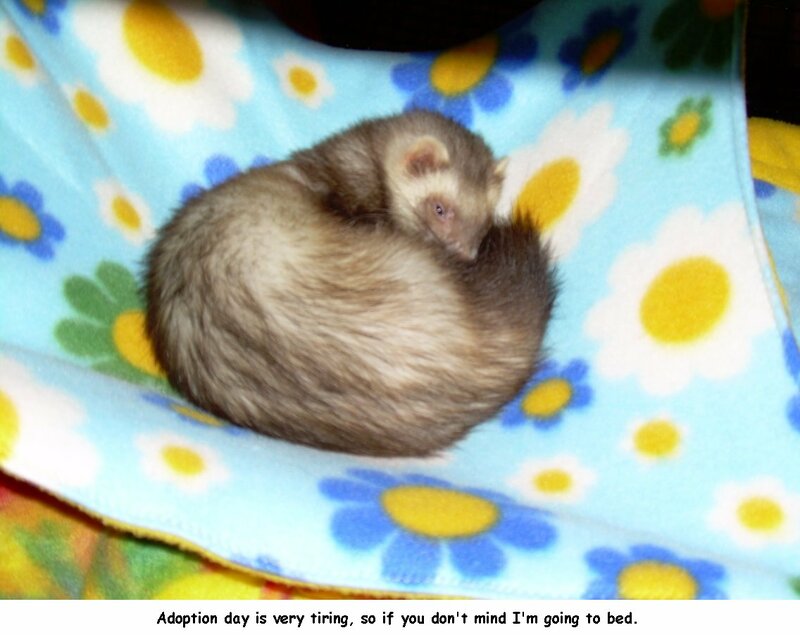 Adoption day is very tiring, so if you don't mind I'm going to bed. Jynx and Snow's new mommy ( who is fifteen years old) is so thrilled with her new kids that she wrote us the following letter. 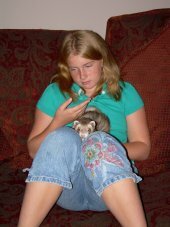 When I first began looking for a good place to adopt a ferret or ferrets from, I started with a few local rescues and I kept getting turned down because I was "too young" and "immature" to take care of such delecate creatures that involved so much time and care. 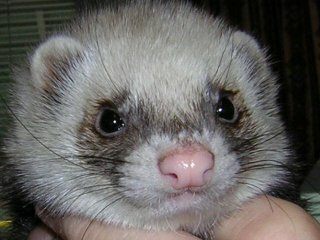 They said that I should go with a hamster instead because I would probably lose interest in a short time and hamsters don't live as long. Just before I gave up I decided to send a couple more emails to other rescues, and that's when I got an email back from Kim Fox, the director of this wonderful organization. She talked me though all the care involved and the costs and she gave me a list of the adoptables and told me a few stories about each one. 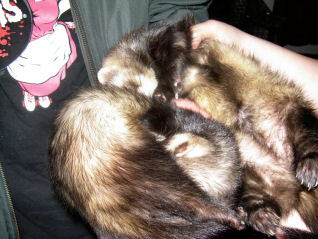 I ended up falling in love with two adorable ferrets named Jynx and Snow. 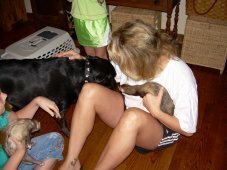 Kim came to my house with my new kids and helped them settle in and showed me how to take care of them. I'm so glad that I got these two fuzzbutts. 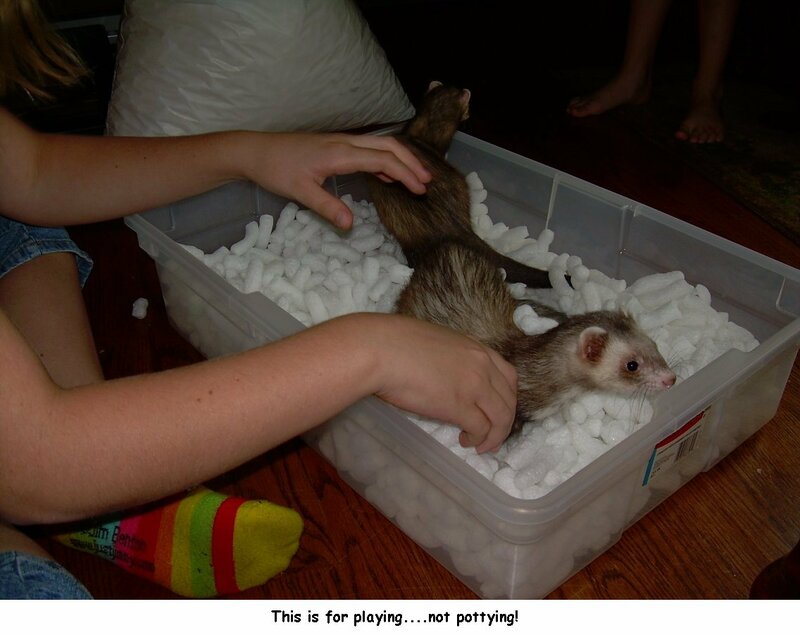 They are amazingly funny and I love playing with them and watching them explore. I'm so thankful to Kim and all that she has done for me and my new kids! Hi, I'm Hershel (Hershel Krustovsky)( on the left) and my buddy Bosley. When I came in, the humane society people were talking about putting me down cause I had trouble walking and they didn't think the rescue would take me. Boy, was that a close call. Rescue mom Caroline scooped me up real quick and said "Of course we'll take him!" The nice vet lady says she thinks I had an accident and got hurt and have neurological damage and that's what makes me walk funny but don't feel sorry for me, I get around really good and I play too! 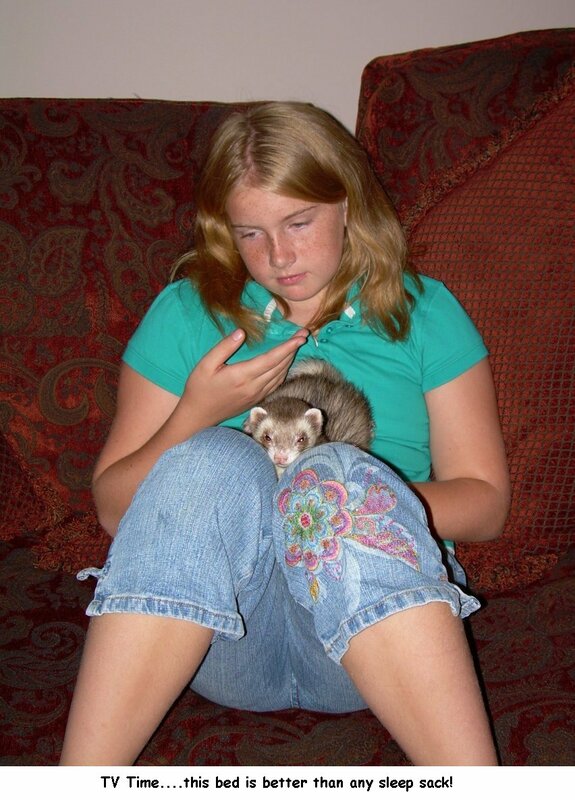 AND I am the bestest lap ferret out of all of us. When you are having A bad day I will give you cuddles and make it all go away real quick! Me and da Boz man gotz to stay together too, so plan on adoptin both of us! I volunteer at the SUMS on Mondays. My favorite part is seeing all the new fuzzys who come to the shelter. One day, low and behold, I saw two very large saucer eyes peering out of the cage. 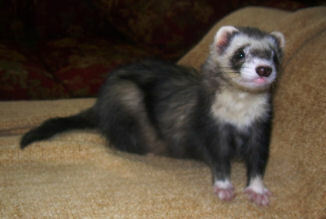 They belonged to Hershel who has neurological damage to his front paws due to an unknown injury. 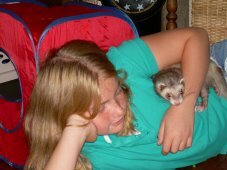 However, the love this ferret gives is never ending. 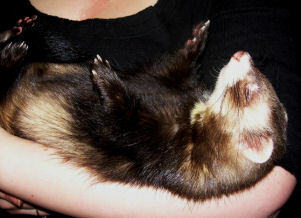 He is warmest, loving lap ferrett there could ever be. 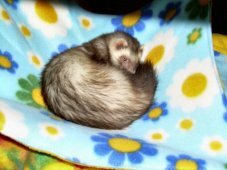 As an extra bonus there was Bosley n/k/a Oliver, his brother who came along to live in my home who is a handsome, fun loving ferrett. They are a great addition to my furkid family now 5 total. This is Franke, who's name is now Crockett. 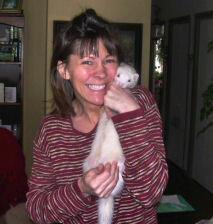 He was adopted by our board members Jack & Angie Light who just could not resist adding ferret # 8 to their business. He now gets everything a fuzzy should. 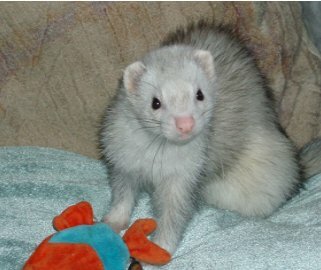 Lots of love, attention and PLAY TIME and has seven other fuzzy friends. When he came in he looked like a sable, but looks to have grown into a beautiful sable point. Congratulations Crockett, Jack and Angie.